The work, outlined in a patent application, is the latest in a line of research by the company that points to future head-mounted displays that don't require the clunky display arm that's present on the first generation Google Glass. 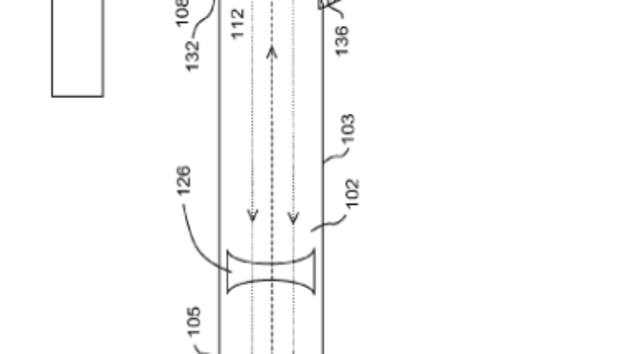 The design detailed in U.S. patent application 20130207887 calls for a small display to be mounted onto the surface of the lens of a pair of glasses. The display and a companion light source are located on the periphery of the lens and the image is funneled to the area in front of the user's eye with a couple of optical beam splitters -- passive optical devices that bend and route light. In their patent application, the engineers have also included an eye-tracking camera and a couple of small lamps that illuminate the eye. One illuminates the entire eye and the other provides a focused beam that creates a glint in the eye to aid tracking, both likely operating at wavelengths invisible to humans. In one of several images accompanying the application, a pair of glasses is shown with the heads-up display and eye-tracking technology mounted on each lens, but it could be used on just one lens, the application notes. In use, the system could funnel a stream of information to the user like the current Google Glass devices. They allow wearers to read email, get news alerts, and receive other data overlaid in their field of vision. The patent application also includes the possibility of a second camera that looks away from the wearer to enable augmented reality. "In an embodiment with a secondary camera that captures an image of [the scene], [a] computer can use the eye tracking data and scene images to tell what part of [the scene] the user is focused on, and can use the additional data, such as the user's location established via GPS, for example, to provide information to the user about the part of the scene they are looking at," the application reads. The application, which was published on Thursday, is the latest in a line of wearable computing patents filed by Google. Earlier this week the company filed an application for a similar invention that just tracks the movement of the eye without the embedded display.